My bedroom was a mess. We threw 2 suitcases in there filled with more than just clothes, plus other things from our recent trip to Oregon. Then it just became a dumping ground for more clothes and other sundry items. It was not a pretty sight. But before I cleaned it up, I thought it would be a good idea if I showed you the power of the timer in real life. My life. My real, unedited life. So I took a picture of the mess before I’d touched anything. So how long do you think it would take to clean up this mess? And by clean it up, I don’t mean move it to another part of my bedroom then take a picture. I’m talking everything put away in their proper place. Remember, both suitcases are filled with stuff. Both backpacks are filled with stuff. 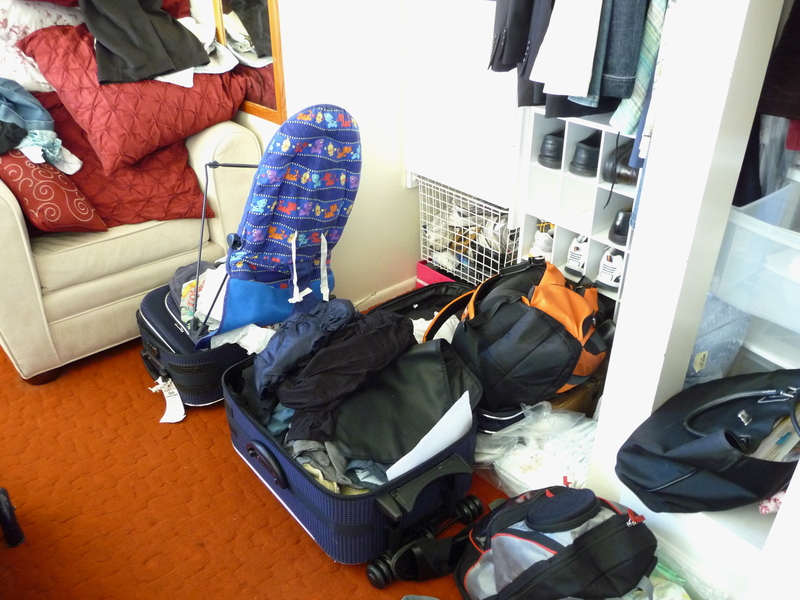 And then there’s all the stuff on top of the suitcases, on top of the chair, and the area next to the big, white, obnoxious white thing in the bottom right part of the picture. How long do you think it’ll take? Leave a comment with your guesses and the person with the closest guess gets to pick the next thing I blog about. After all the guesses are in, I’ll let you know how long it really took me, complete with pictures. This entry was posted in Organizing and tagged timer, unpacking. Bookmark the permalink. Okay, if I was committed and using a timer (which I do too) that would take me all day. Less if I didn’t have kids, but kids distract. Time estimate…8 hours? I guess it took you about 30-45 minutes! Yep, I think you are that good. I think knowing your knack for organizing that it will take you 3 hours and 15 minutes.